We traveled to England this summer and, as wonderful as it was, we initially found it hard to leave home! We'd been through one of the hardest seasons ever as a family and felt guilty for leaving! Isn't life like that, though? Always melting together the good and the bad... joy and pain...hurt and healing? We prefer being the people who show up for others, but we've been brought to our knees by the TLC we've been given during 2018. We're learning (again) what is (and ISN'T) helpful as we try to survive this world's dark days. We have had some ugly cry-fests (heck, I had one just last night in the middle of an important but painful conversation)! We are discovering all over again what a gift it is when someone is brave enough to enter into our pain...to simply offer their presence. You never forget the people who are willing to do that! Most (actually ALL) of my disappointments in church communities can be traced back to humans trying to "play God" rather than leaving that job to the One whose first priority is our hearts (not our behaviors). Helping one another through heavy stuff doesn't mean we play the part of a miracle worker. It isn't our job to redeem each other's pain. In faith communities, it's easy to fall into the trap of trying to over-spiritualize someone's pain and tell them what they "should" do or enlighten them on "what God might be trying to do..." Regardless of the well-meaning intentions behind that response, trying to speak on God's behalf can actually add to the weight of our questions and pain. We believe our job as fellow-humans is to "walk each other home." To be present. To share the load simply by listening, without trying minimizing others' experiences or offering commentary. To offer empathy, not shame or solutions. To understand that life's pain is real. We can't rescue anyone from that, but we can come along next to one another and express how much we care and how sad we are that they're hurting. We can all learn from our pain in time, but first we have to be allowed to acknowledge it and feel it. 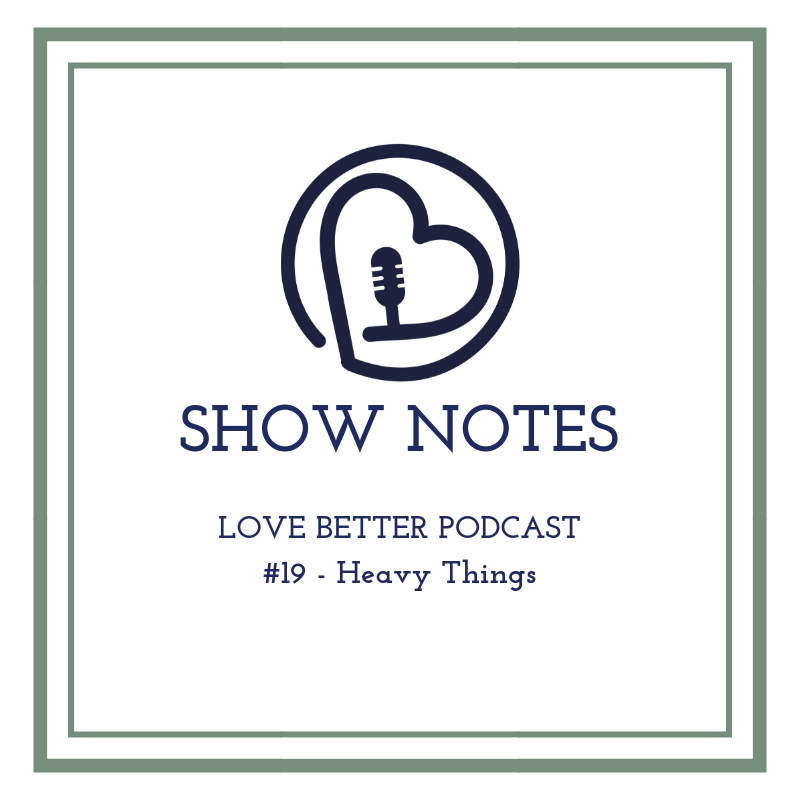 There is a "beautiful sadness" about letting go of all our coping mechanisms and pat answers. There's a relief in not pretending everything is fine. Expressing pain and sadness in a safe space eventually allows us to move forward without dragging our heavy baggage along indefinitely. It softens us so we can bend and grow stronger in time. We would love to hear your stories and thoughts on how you process the HEAVY THINGS in your life and what you've found helpful!